Director of R&D, Greensaver: "Two comments on the cycle life test result: (a) The cutoff voltage was too low. Overdischarge will cause low cycle life. It is suggested that the depth of discharge is limited to 80%, and the cutoff voltage is set at 11.4 ~ 11.5V. (b) The average discharge currents were relatively high. In this case, the recharge current is suggested to choose the same rate of high current to improve the cycle life of batteries." Point 2 would be difficult to implement due to the cost, size and primary current of chargers. The capacity is normalised to 1Ah discharge as varying discharge currents were used. 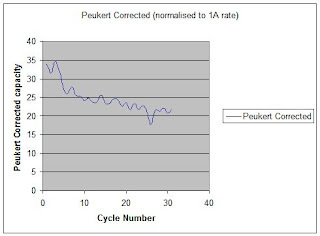 This eliminates the effect of the Peukert factor at different discharge rates. The 'waves' are caused by slightly different end point volatages at different currents.